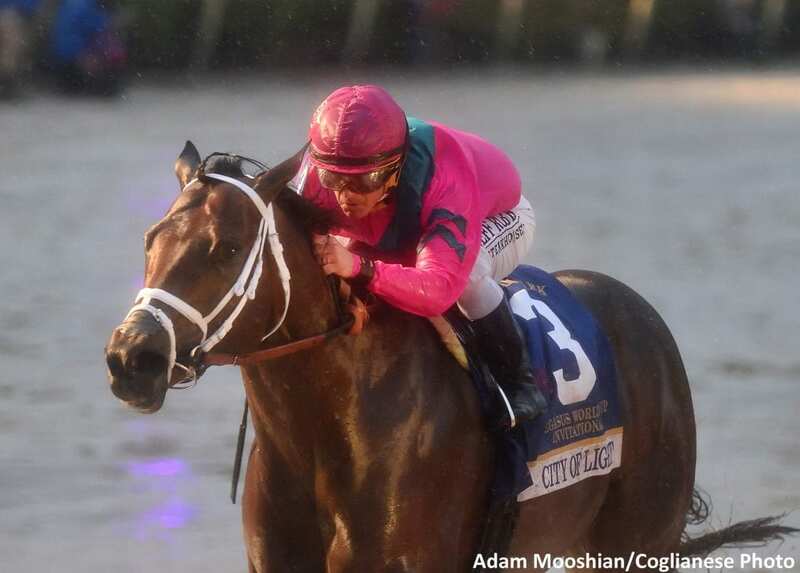 Javier Castellano guided City of Light to a dominant score in the Pegasus World Cup Invitational Stakes on Jan. 26 at Gulfstream Park, which put the exclamation point on a productive first month of the racing calendar for the Venezuelan-born rider. The Pegasus was Castellano's fourth graded stakes win on the year, securing the lead after the first milepost over Flavien Prat with three, and Irad Ortiz Jr., and Mike Smith, who each have two. Earlier on the Pegasus card, Castellano booted home Dream Pauline in the G3 Hurricane Bertie Stakes to put himself in position to take over sole possession of the lead in the card's main event. Gulfstream Park's Championship Meet has been a strong one for Castellano, who also won the G3 Tropical Turf Handicap aboard Doctor Mounty, and the G3 Marshua's River Stakes on Bellavais, both on Jan. 12. Castellano finished fifth last year by North American graded stakes wins, with 23. Lane's End, North America's top consignor by graded stakes winners in 2018, started off the new year at the top of the standings once again, with three winners led by City of Light and Doctor Mounty. The consignment was represented on the Kentucky Derby trail by G3 Lecomte Stakes winner War of Will. The Lane's End stallion division also made an appearance at the top of the sire list, with resident Quality Road tying for the lead with Street Sense and Tapit, each with two. Quality Road was represented by City of Light and Bellafina, winner of the G2 Santa Ynez Stakes at Santa Anita Park. Street Sense, a resident of Darley America, was boosted by Doctor Mounty and Aztec Sense, who won the G3 Fred W. Hooper Stakes at Gulfstream. Gainesway's Tapit picked up wins with Bellavais and Dream Pauline. January also finished with a three-way tie in the trainer race. Richard Baltas hit the mark with Next Shares in the G3 San Gabriel Stakes and with Pantsonfire in the G3 Astra Stakes, both at Santa Anita. Jerry Hollendorfer also racked up a pair of G3 wins on the West Coast, taking the Sham Stakes with Gunmetal Gray and the Megahertz Stakes with Vasilika. Mike Maker rounded out the trio, saddling Bigger Picture in the G3 John B. Connally Turf Cup Stakes at Sam Houston, and Zulu Alpha in the G3 W.L. McKnight Handicap at Gulfstream Park. This entry was posted in American Graded Stakes Standings, Features, NL List and tagged American Graded Stakes Standings, bellavais, city of light, doctor mounty, dream pauline, Javier Castellano, jerry hollendorfer, Lane's End, mike maker, Pegasus World Cup Invitational, Quality Road, Richard Baltas, Street Sense, tapit, war of will by Joe Nevills. Bookmark the permalink.